42% of video shares now happen in the first 3 days of launch; Unruly launches in-stream format to help advertisers cope with increase in pace. The percentage of shares a brand video attracts online in its first three days of launch has almost doubled in 12 months. That’s according to new research by marketing technology company Unruly into the lifecycle of a viral video. Unruly’s Social Diffusion Curve, which measures the speed of social diffusion for the top 4,000 videos across the social web, was first launched in April last year and found that a quarter of the average online branded video’s shares occur in the first three days of its launch. A year later, that percentage has almost doubled to 42%, making the first few days even more crucial for marketers hoping to make their ads the talk of the web. 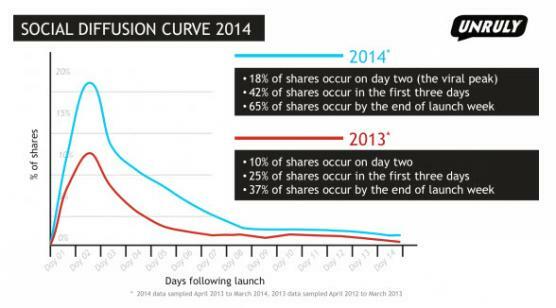 The average percentage of shares on the day following launch, when the most shares usually happen, has also almost doubled from 10% to 18% over the last 12 months, while shares in the first week have also risen from 37% to 65%. To help marketers cope with the speed of social and maximize the viral peak, Unruly has launched a new skippable pre-roll format in Unruly Activate™, the video distribution platform that engages 1.17 billion viewers across the Open Web. With 74.1% of video views now happening outside of YouTube and its player (source: comScore Video Metrix, January 2014), Unruly’s in-stream format delivers cost-efficient, mass reach across the Open Web in the crucial kick-off phase following campaign launch. The format also marks Unruly’s entry into the programmatic ecosystem. Integrations with 60+ Data Management Platforms offer online and offline behavioral targeting and the unit features prominent sharing and branding to lift social and brand metrics. To find out more about Unruly Activate and Unruly’s new skippable in-stream format, click here. UNRULY, UNRULY ACTIVATE, UNRULY ANALYTICS and logos and associated marks are trademarks of Unruly Group. Other marks are owned by their respective owners. Marketing technology company Unruly is the leading global platform for social video marketing and works with top brands and their agencies to get their videos watched, tracked and shared across the Open Web. Our programmatic video platform reaches and engages the half of the global Internet population who are watching and sharing videos outside of YouTube. Unruly’s end-to-end solution cracks the code on social video sharing. Advertisers can accurately and algorithmically predict earned media with Unruly ShareRank. They can engage 1.17 billion people (comScore Feb 2014) across the Open Web with Unruly Activate, the world’s biggest and most sophisticated social video distribution platform. And prove ROI with Unruly Analytics, a cloud-based dashboard providing real-time competitive benchmarks across 6 billion customizable data points. Founded in 2006, Unruly has 12 offices and employs 150 people globally. In 2012, Unruly secured a $25 million Series A investment led by Amadeus, Van den Ende & Deitmers and Business Growth Fund. The company has won 26 awards, including ‘Best Content Distribution Platform’ at the Braves Awards; ‘Digital Innovator of the Year’ at the Sunday Times Hiscox Tech Track 100; ‘International Management Team of the Year’ at the BVCA Awards 2013 and #14 on the Deloitte Technology Fast 500 EMEA. Unruly has been selected by Tech City as a Future Fifty Company.